AvailabilityThis item ships separately from other warehouses. Usually leaves the warehouse on the same business day. The Gaggia Classic is a best selling model, loved by coffee aficionados worldwide. 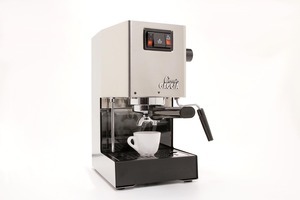 A commercial-style brew group and chrome-plated marine brass portafilter offer heat stability while intuitive controls make machine operation a breeze. The Gaggia Classic comes with two stainless steel filter baskets (one and two shot), a coffee tamper, a 7-gram measuring scoop, and an instructional CD. Gaggia Classic Espresso Machine Overview. The Gaggia Classic is the best selling home espresso machine. Named in Consumer Digest 2011 edition as the best home model for the price. You can make Latte's, cappuccino's, espresso and much more. The stainless steel housing and chrome plated brass portifilter ensure you make quality espresso each and every time. US Warranty 2 Years Limited Warranty on defects in materials and workmanship.